)—are extremely important, much more important that they are in the States. They may in fact be the single most important part of any business meeting. No kidding! 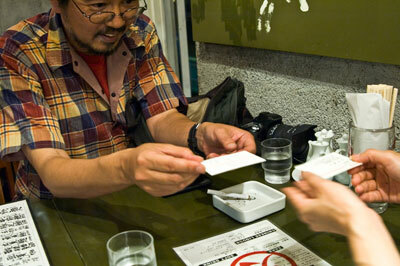 There is a set ritual for how to present and how to accept Japanese business cards that should be learned and memorized. Also, there are a number of accessories for taking care of your business card collection, including a binder for collecting your meishi (just like baseball cards!). Why are Japanese business cards so important? One of the main reasons such value is placed on the business card is because social rank is extremely important in this country. Basically, one is above or below someone—never equal. This is serious business. At one time, an easy way to establish rank was age. You’re older than me, you are above me in rank, and vice versa. What if two people are the same age, I hear you ask. That’s when we look at the birth month, birth day, even the exact minute of birth! That guy who was born just two minutes before you… he’s your superior as far as social rank is concerned. This is still a valid way to determine social ranking, but another factor is at work in today’s world, and that is career. A doctor is higher than a plumber, for example. And what better way to gain this information than the Japanese business card! This assessment of level is critical in determining social interaction. People simply don’t know how to talk to each other without information of social rank. Why? Thank you so very much for allowing me the honor of being in your presence, your godliness. One is pretty casual, one is about normal, one is more polite, one is extremely polite. Now imagine this politeness level distinction in every word of the language! But…that’s not all… As confusing as the above sounds, it gets even more complicated. Now, this isn’t a language article so I won’t go into it in too much detail, but basically one uses (depending on the relationship) humble words to refer to himself and honorific words to refer to the guy above them. You can kind of see this in my last example above. To add to the confusing, social rank can change depending on the relationship. For example, in a department store the customer is always superior to the employee and will receive polite speech, even if the employee is older and would outside of work be a higher rank. So… we have these different levels of politeness in Japanese. That’s nice. Er…why? Well, my friends, they are there for a reason, and this is where social rank comes more into play. I hinted at this above, but let me say it more clearly. You always have to use polite speech for people above you in rank, and you should use regular speech or even casual speech for people below you in rank. Easy, huh? Now sometimes older women will use polite speech for people below them in rank, but this kind of politeness is usually only shown by older women, and even then they will often use other words to show they are the superior in rank and know it. Are you weak or strong? Use the right speech level! Knowledge of social rank is also needed to determine how to bow to someone. The higher they are above you, the lower and longer the bow. Someone below you may only need a nod, but someone far above you may require a full 90 degree bow held for several seconds. The later is rather extreme, but you will see it sometimes (when people meet the emperor, for instance2). Weren’t we talking about Japanese business cards? 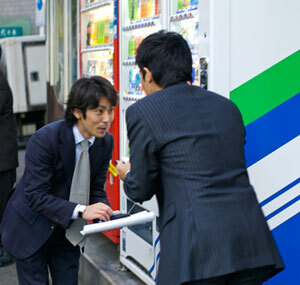 All the above makes the meishi critical, especially for salarymen. When two people meet for the first time they will greet each other very politely. They will then immediately hand their meishi over. This isn’t the casual one-handed ”here’s my card” we use in the West. No no no, that would cause looks of complete horror here. One’s meishi is a representation of oneself and thus needs to be treated extremely respectfully by both people. The correct way to hand over your Japanese business card is to slightly bow, holding it with both hands, correctly oriented to face the person receiving it. The receiver then takes it with both hands while also bowing slightly. Typically he will then study it for a few minutes, reading it while frowning and making occasional ”ah” noises to show how much he is concentrating on this task. Politeness dictates he then make some kind of comment and ask some small questions about the business card. Then he will place it carefully in his meishi holder and into his suit coat pocket. Did you say meishi holder? It is considered rude to give someone a Japanese business card that is bent or in any way not perfect. Also, as I said above a meishi represents you. To simply pull it out of your pocket or wallet gives a really bad image, suggesting you don’t really care about yourself. People spend a lot of money on fancy holders or cases to house their own meishi and any they receive from other people. This usually isn’t just an act for the other person’s benefit. Even when the meeting is over and the other person is gone, their meishi will be treated with respect. Business men buy giant binders to house and protect all the meishi they collect. Now with that out of the way, valuable knowledge is gained such as who will pour beer for whom at drinking parties (every night after work). You can see how important Japanese business cards are! Return from "Japanese Business Cards" to "Japanese Cuture"